Jeanne Antide Thouret was born on the 27th November at Sancy-le-Long, France, the fifth child of eight children. Her mother died when Jeanne was 15, leaving her to care for her father and siblings. In 1787, at the age of 22, Jeanne entered the congregation of the Daughters of Charity, hoping to live a life of prayer, community life and service to the poor. During the suppression of religious orders in the French Revolution in 1793, Jeanne was ordered home to a secular life. She refused, and tried to escape but was captured and beaten so badly that it took her months to recover from her injuries. This did not deter Jeanne from continuing her work of caring for the sick, the poor and those wounded during the Revolution. In response to a request from these, Jeanne was able in 1799 to return to France where she opened a school, a dispensary, and a soup kitchen for the poor in Besançon. With a small group of helpers, Jeanne founded a new Congregation of the Sisters of Charity to maintain and develop these works. In 1810, Jeanne was called to Naples where she was faced with a very hierarchical social system where the wealthy never encountered the poor. 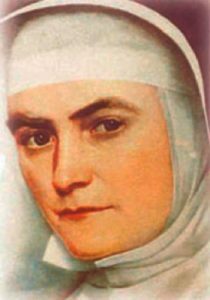 She was given the responsibility of the Hospital of the Incurable, the largest hospital in the city, with the Sisters often visiting the poor and sick in their homes. In 1819, the Pope approved the Rule of Life, a book she wrote as a guide for the women who followed her. Jeanne Antide died in Naples in 1826. Saint Jeanne, awaken in us a sensitivity to the needs of others around us. Alberto Cruchaga was born in Vina del Mar, Chile. His father died when he was four. Though impoverished. he was well-educated, having earned a scholarship to the Jesuit College in Santiago, where he developed a lively interest in the poor. In 1923 he entered the Jesuit novitiate and after ordination began his ministry as a teacher and retreat master to young men. In 1941 he published his book, Is Chile a Catholic Country? which spearheaded the Church’s social programmes in that country. He became national chaplain to the youth movement of Catholic Action. Vivacious, enthusiastic, and open to all, he was a true ‘Father of Chile’, devoted to the poor, especially those who were helpless victims. He wrote and lectured throughout Chile to awaken the Christian conscience, using his firsthand knowledge and personal experiences as a missionary to arouse his fellow countrymen. He opened a house for children and then similar ones for women and men where a home-like atmosphere was provided for the homeless. These homes multiplied. 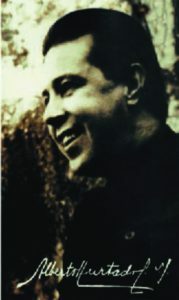 In 1947 Alberto founded the Chilean Trade Union Association to promote a union movement based on the Church’s social teaching. He wrote three important works on trade unions, social humanism and the Christian social order. Then he founded a journal dedicated to explaining the Church’s teaching. At age 51, he died of pancreatic cancer. In the midst of terrible pain, he was often heard to say: “I am happy, Lord.” He died on 18 August 1952. Saint Alberto, fill us with a Christian thirst for social justice. Raymond was born at Portella, Catalonia, Spain. His mother died in childbirth and he was delivered by caesarean. Hence his name, non natus – not born. 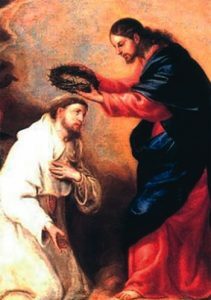 He joined the Mercedarians under Saint Peter Nolasco at Barcelona and succeeded him as chief ransomer, going to Algeria to ransom slaves. When his money ran out, he remained as hostage for several slaves and was sentenced to be impaled when the governor learned that he had converted several Muslims. He escaped the death sentence because of the ransom he would bring, but was forced to run the gauntlet. He was then tortured for continuing his evangelising activities. He was ransomed eight months later by Peter Nolasco. On his return to Barcelona in 1239, he was appointed Cardinal by Pope Gregory IX, but died the next year while on the way to Rome. Saint Raymond, teach us how best to help those in slavery.